Implanted sensors will enable the next generation of healthcare by in-situ testing of abnormal physiological conditions, personalized medicine and proactive drug delivery. Some important functions of these implants are to transmit measurements to an external processing center for real time monitoring, receive updates on drug delivery volumes, and directly initiate actions of embedded actuators. All these examples require energy efficient communication of data between implants through the body tissues, which is difficult to achieve in conventional radio frequency waves owing to their high attenuation within the body. 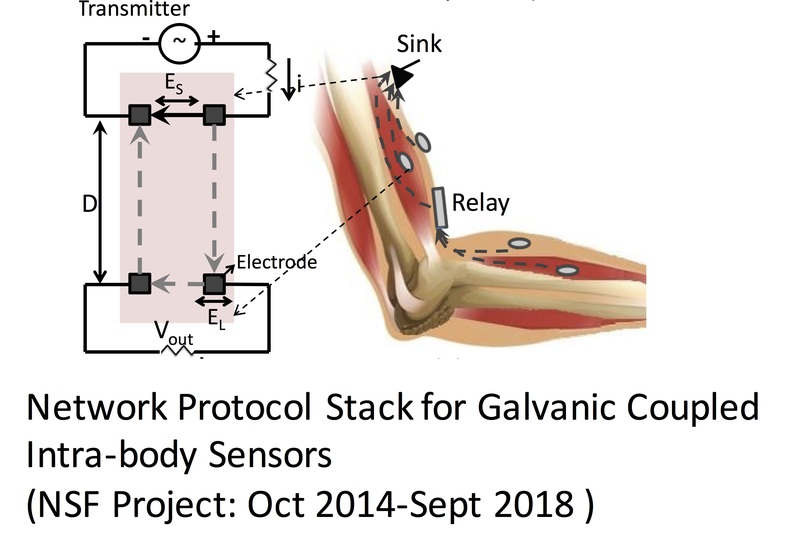 We propose to use galvanically coupled weak electrical currents instead of over the air RF waves to connect the implants, which results in energy savings of two orders of magnitude within tissues (see Fig. 1). Building on our efforts on modeling the intra-body channel, we will develop a network protocol stack that incorporates transmitter parameters selection, medium access control, multicast transmissions, end to end data delivery through relays and latency calculations. Fig. 1. Galvanic coupling setup on skin surface with multiple tissue layers (a) Top view (b) Lateral view. Majority of the induced current passes through the return path of transmitter and a minor part through the body. Though the galvanic coupling approach leverages the conductivity properties of body tissues, most existing efforts have been limited to signal propagation studies on the skin surface. The proposed research is the first effort to systematically devise networking protocols and algorithms for realizing the promise of intra-body networks. We will explore the concept of signal reflection and refraction at the tissue boundaries to direct the dominant component of the transmitted signals towards the next hop receiver. We will devise interference-free medium access schemes that take into account heat generated at the crossings of the signal paths for all simultaneously active transceiver pairs. We will devise strategies for placement of on-skin relay nodes for retrieving the implant data from various locations in the body that (i) minimize the end to end data gathering latency, and (ii) are constrained by feasible on-body locations. We will devise a physical layer communication system, with an emphasis on low power and complexity, adhering to the requirements for integration with various health-care applications. Fig. 2. Summary of key outcomes and research results. 1. Building channel models: We developed analytical models that involve (i) a suite of expressions for modeling the resulting communication channel for weak electrical signals in a three dimensional tissue structure, (ii) validating and verifying this electrical-equivalent tissue model through extensive finite element simulations (Fig 3(a)), published measurements in existing literature, and channel sounding experiments conducted with porcine tissue, (iii) empirically obtaining the channel impulse and frequency response and (iv) obtaining the influence of different network and hardware parameters such as transmission frequency and electrode placements. Fig. 3(a) Equivalent circuit of (a) single tissue (b) cell, and (c) the overall 3-D electrode and coupling impedance of the tissues. Fig. 4(a) Channel sounding testbed system block diagram, 3(b) Channel sounding testbed experimental setup, including porcine tissue. Fig. 5 The channel gain obtained using our analytical model is compared with measurements made using the porcine tissue. The model gain along the M-M path outperforms the S-S path by about 18 dB in 5 cm and 14 dB in 10 cm, as expected from measurements. We derived, verified and validated the equivalent electrical circuit model for human tissues in characterizing the physical layer (see attached plot in Fig. 5). We found that a maximum of 15 dB in channel gain could result from variation in tissue properties from person to person. 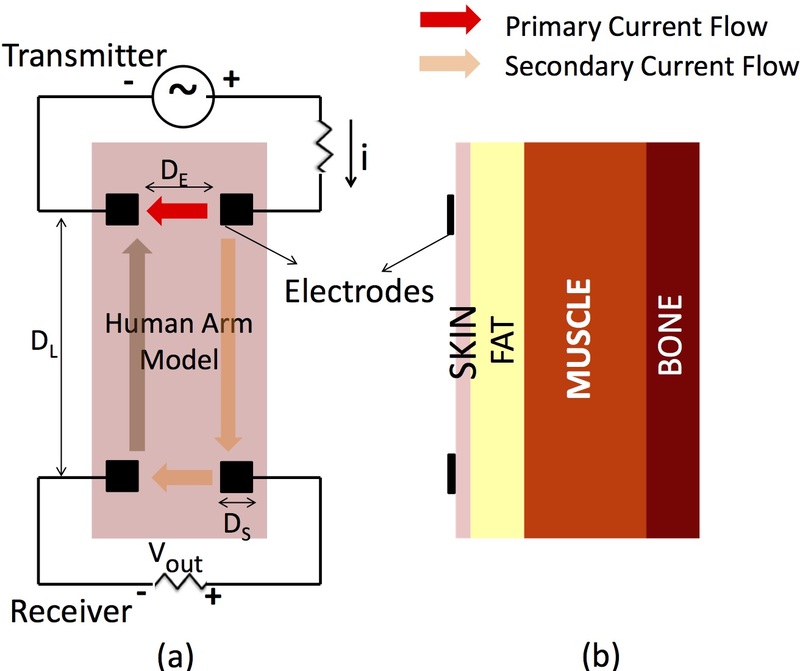 We identified the optimal frequency to lie between 100 kHz to 1 MHz for both on skin and in muscle paths, and determined that placing both the sender and receiver sensors within the muscle offered better channel propagation characteristics, as opposed to on the skin. 2. Topology optimization for implanted sensors: We developed a topology management strategy using a method called as the Weiszfeld algorithm that attempts to minimize the transmission power of the body nodes by reducing their distance to the on-skin relay that gather and forward the received information. It takes into account the unique propagation model of the electrical signals within the body at various tissue layers. 3. Multicast communication: We devised simple techniques to allow single implant embedded within a tissue layer to simultaneously transmit data to a peer node within the same layer, as well as to an upstream node in a layer immediately above. 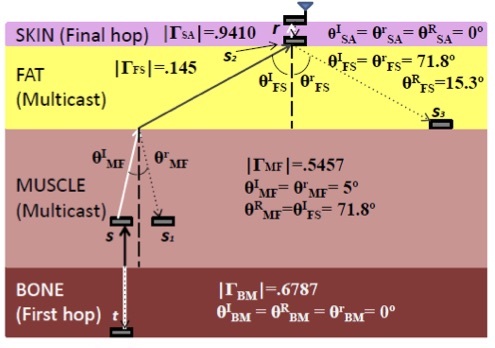 This is the first demonstration of a multi-cast network for galvanic coupled IBNs through appropriate selection of angle of signal transmission with respect to the tissue plane, the frequency and amplitude of the signal. We wanted to use the signal transmission from the source node (with refraction incorporated) to reach the next hop implant (say, s1) in the subsequent tissue layer. The reflected signal will be used to reach another implant node (say, s2) in the same tissue layer (see Fig. 4). Fig. 6. An example scenario of reflection and refraction for an operating frequency of 300 kHz, on a block of tissue 400 mm in length. Tissue boundaries are named as: Skin-Air (SA), Fat-Skin (FS), Muscle-Fat (MF) and Bone-Muscle (BM). At first, the initial hop from bone to muscle is initiated by node t. The source of the multi-cast, s, then forwards the information to s1 (both in muscle) through reflection, and to s2 (in skin), through refraction. The reflected transmission resulting from communication between s1 and s2, sends data along another path, to s3 (in fat). Finally, the implant s2 becomes the final hop source and transmits to the relay node r placed on the skin surface. 4. 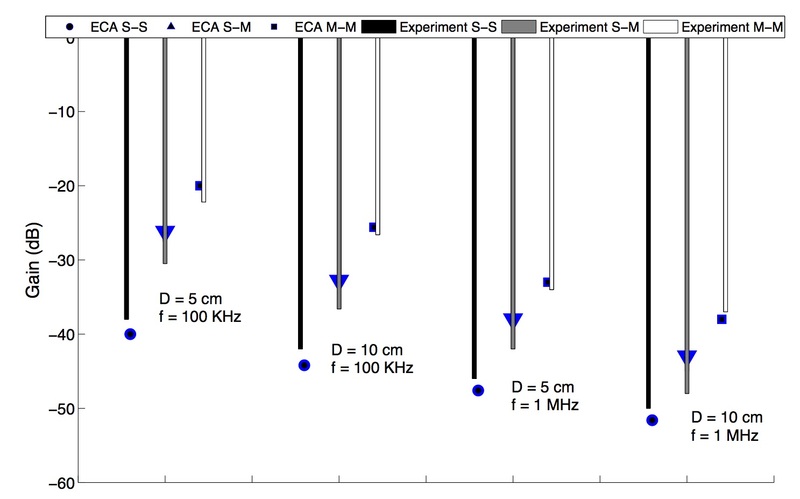 Noise and capacity estimation: We formulated closed form expressions for the noise that impacts correct signal reception and then estimated the signal to noise ratio, which is the first step towards selection of suitable modulation schemes. We also estimated the capacity of a galvanic coupled link and analyzed the maximum traffic that can be accommodated in terms of the number of nodes. 5. 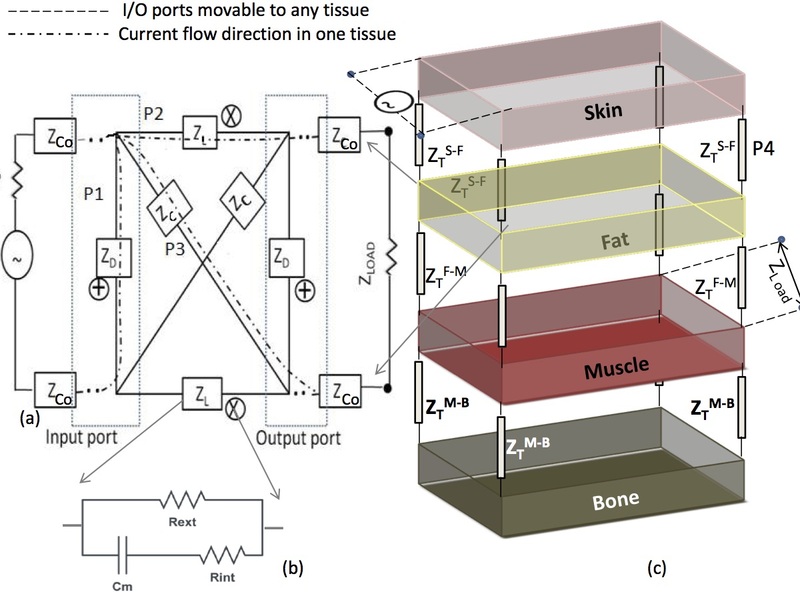 Building tissue heating models and scheduling safe transmissions: We analyzed the thermal distribution within tissues, for galvanic coupling-based communication for varying transmission power levels, number of collocated transmitters, and blood perfusion conditions using finite element based numerical simulation and skin-phantom based experiments. We also investigated the sensitivity of the spatio-temporal temperature profile in association with the normal and extreme rates of blood perfusion. Furthermore, we devised optimized duty cycles for the implanted sensors and a transmission sequencing policy to control the temperature increase, as well as to improve the per-node bandwidth efficiency. Fig. 7. Skin phantom (7 × 7 × 0.3 × cm cube ) coupled with 2 sources. We use the alligator clips (40 mm) as the exciting and ground electrodes. Simulated spatial thermal profile (◦ C ) after 5e4 secs (top right). The temperature rise is linear with almost the same slope in the phantom (bottom right). 6. Optimal Relay Node Placement: Utilizing measurement-driven tissue channel models, we developed a strategy for optimal placement of data collection points/relays, exploiting galvanic coupling intra-body communication, in order to form an energy-efficient topology. Within this framework, by employing a clustering-based algorithm, the energy consumption is balanced over the entire implant network and the position of an external data-gathering point is selected while ensuring that application needs are met. This is the first demonstration of a practical network design that leverages the specific channel observations. Moreover, we derived acceptable GC-IBN link length distribution that minimizes transmission power for all the nodes, as well as the number of relays, while meeting application demands. This ensures a balanced energy consumption among all the nodes. 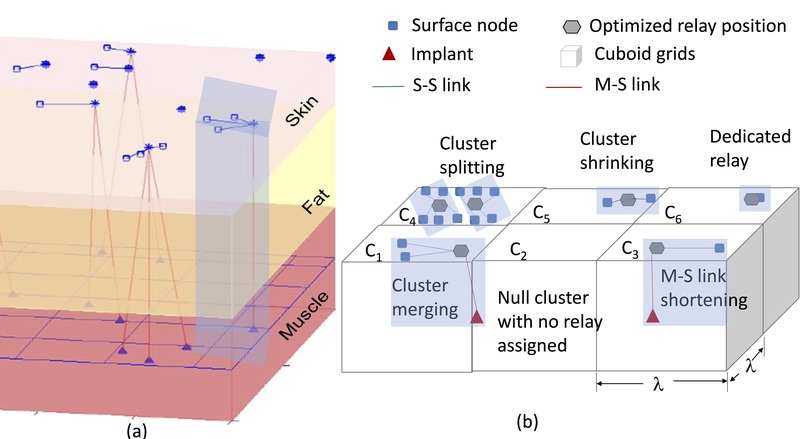 In addition, we evaluated the effectiveness of the proposed clustering framework using detailed simulation models and experimental studies involving porcine tissue. Fig. 8. Snapshot of clustered implants with multiple tissue layers. (b) Clustering objectives from INFOCOM 2016. Gray lines represent uniform grids and shaded blue area denotes optimized clusters. 7. Beamforming in the body: Implants are poised to revolutionize personalized healthcare by monitoring and actuating physiological functions. Such implants operate under challenging constraints of limited battery energy, heterogeneous tissue-dependent channel conditions and human-safety regulations. 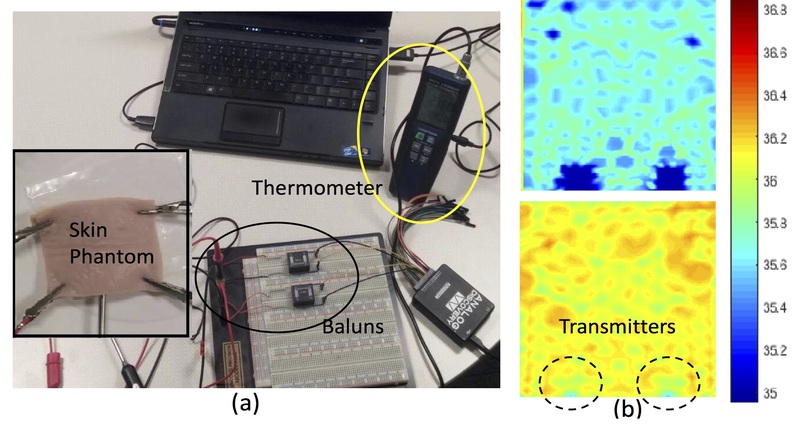 To address these issues, we propose a new cross-layer protocol for galvanic coupled implants wherein weak electrical currents are used in place of classical radio frequency (RF) links. As the first step, we devise a method that allows multiple implants to communicate individual sensed data to each other through CDMA code assignments, but delegate the computational burden of decoding only to the on-body surface relays. Then, we devise a distributed beamforming approach that allows coordinated transmissions from the implants to the relays by considering the specific tissue path chosen and tissue heating-related safety constraints. Our contributions are two fold: First, we devise a collisionfree protocol that prevents undue interference at neighboring implants, especially for multiple deployments. Second, this is the first application of near-field distributed beamforming in human tissue. Results reveal significant improvement in the network lifetime for implants of up to 79% compared to galvanic coupled links without beamforming. Fig. 9. Human fore-arm GC-IBN with muscle implants and surface relay. 8. 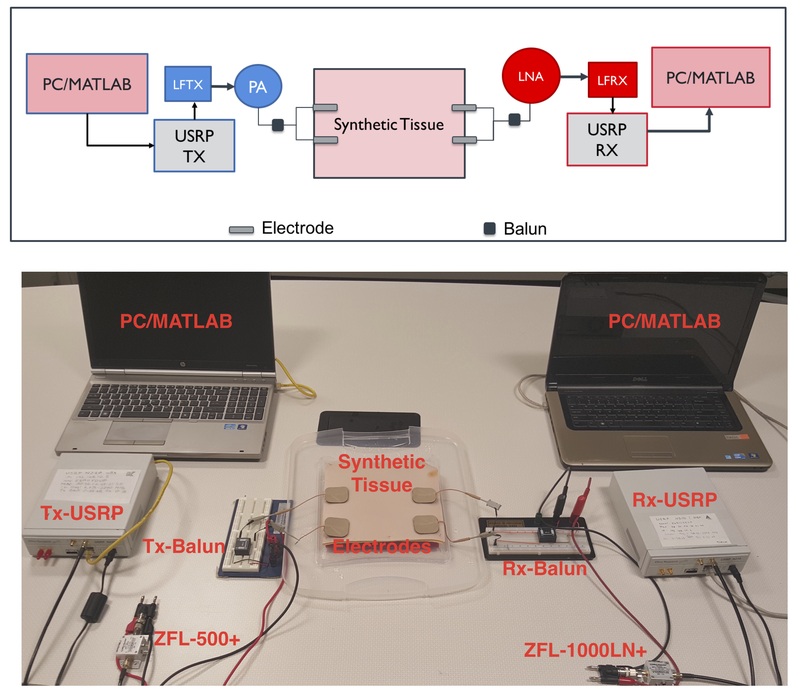 Real-time channel assessment: We demonstrated an experimental setup to implement and validate physical layer communication schemes and link layer protocols using off-the-shelf hardware and commercially procured synthetic human tissue. This setup employed the Universal Software Radio Peripherals (USRPs) as the transmitter and receiver nodes, with additional interfacing electronics, to allow flexible transmission of galvanic coupled signals in the 100 kHz - 1 MHz frequency range. Fig. 10. Block diagram of GC-IBC testbed (top) and the actual testbed implementation (bottom).